Buying Under Armour and Foot Locker are the moves to make in the sneaker space, according to Jefferies analyst Randal Konik. Under Armour will gain market share on Adidas, and Foot Locker sells a lot of Under Armour products. Watch Under Armour, Foot Locker, and trade in real time here. There’s a dramatic shift happening in the sneaker industry and Under Armour and Foot Locker are poised to be the biggest winners according to one Wall Street analyst. Over the past year, sneakers branded around fashion were were all the rave. But Jefferies analyst Randal Konik says consumer tastes are changing and now they are looking for sneakers that enhance athletic performance, regardless of fashion and style. Konik says going forward this will change which sneaker brands capture market share in North America. “We think you buy Under Armour and Foot Locker,” Konik wrote in a note to clients. The suggestion is partly rooted in his call that Under Armour and Nike are bound to take back significant market share in North America. He cited slowing Adidas sales in the segment, which is caused by a larger shift in what consumers are looking for in sneakers. Adidas saw strong overall sneaker sales in North America in 2017, but that trend gradually fell as the year progressed. That is because Adidas’ fashionable brand was in demand for a moment, but fell out of favour, according to Konik. Adidas’ fashionable Stan Smith and Superstar sneakers sold well in 2017, but saw tapering sales into year end. Consumers shifted their focus to sneakers branded around athletic performance enhancement, which he thinks plays right into the hands of Under Armour and Foot Locker, who have had their fair share of struggles of late. 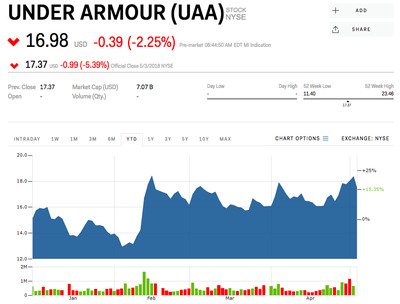 Under Armour has been losing market share in broader sports apparel retail, and shares plummeted by roughly 80% between mid-2015 and mid-2017. It has fallen behind Puma into fourth place for global market share, and risks sliding into fifth place behind New Balance according to Wedbush. Nike is in the same boat as Under Armour, according to Konik. And Foot Locker sells a relatively large number of both Under Armour and Nike sneakers, and is set to capitalise on their comeback. Foot Locker announced in March that it is closing 110 stores this year, after it had closed 117 stores in 2017. The sneaker retailer is one of many such businesses to have fallen victim to Amazon and the e-commerce wave. Shares are down nearly 50% since their December 2016 peak.